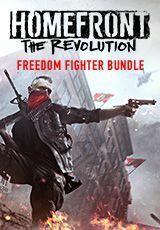 Homefront: The Revolution - is a first-person shooter in which you have to lead the Resistance forces in the guerrilla war against overwhelming odds. All your actions will affect the living, breathing open world - your cell resistance and you will be able to inspire the oppressed to revolt and civil occupation transform into a revolution. But the enemy has an advantage: the best technology, weapons, heavy armor and air support. You must learn the art of guerrilla warfare - ambushes, sabotage, infiltration and disguise - and to give battle in the war-ravaged streets of Philadelphia. And the single player campaign is just the beginning: in a cooperative mode, you and your friends can create your own cell resistance and become the new heroes of the revolution! - Explore a living breathing open world created by the amazing capabilities CRYENGINE game engine. - Variety of guerrilla warfare. It is not linear shooter. Learn the art of guerrilla warfare and use ambushes, sabotage and raids against your opponents. Offering exciting nezaskriptovannye shootout. - Build the Resistance. Recruit new fighters, build bases and shelters, seize and improve your deadly arsenal and create makeshift weapons! - Light the fires of the Revolution! From the oppressed citizen to the leader of the revolution. Epic single player campaign tells the story of the Second War of Independence. Dynamically developing world reacts to your actions as a nation rebels against their captors. - Online co-op mode. Fighting continues online. Create a Resistance cell together with your friends and become a hero of the revolution!